Ah, awards season. Hopeful stars line the red carpets looking their best, while enchanted spectators watch to see who will take home the Golden Globe, Oscar, Grammy, and—oh yes—the coveted Hootsuite Instagrammy. We’ve seen the best of the best—and the worst of the worst—on Instagram, but these accounts truly shine in their categories. And without any further delays or commercial breaks, we’re ready to announce the winners. Sales of bath bombs have increased 71-percent since 2015. In 2017 alone, Lush sold more than 21 million of their handmade bath bombs. As the number one seller of bath bombs in the world, Lush’s customer base is huge—and very active on Instagram. With the widely-shared hashtag #LushLife, Lush takes home the prize for the most explosive user-generated-content. Madame President, your bath is ready. This aptly named fizzer’s red, white and blue color combo creates a stunning purple citrus-scented soak. Cream of tartar and corn starch keep your skin feeling silky. Who run the world? ??????????? ?/ ???? : @thebathingbeaut . . . . Our spring collection is online and in select shops: Robson (Vancouver), North Park (Dallas), Michigan Avenue (Chicago), Tyson’s Center (Tyson’s, VA) and West Edmonton (Edmonton). Keep your eyes peeled on our channels for the launch in all locations. Key takeaway: Make sure you are consistently posting user-generated-content. Create a branded hashtag and encourage your customers to use it for the chance to be featured (and credited) on your page. Glenn Close is a highly-revered legend in her own right, but it’s her Instagram account that solidified a place for her in our hearts. Between sharing candid red carpet pictures with Timothée Chalamet, Glenn shares shots of her beloved dog Pip, her travels, and her children, all with captions that couldn’t be more endearing. If you’re looking for an account that will make you smile on the daily, look no further than Glenn’s page. We just love her. This is SO LAME!! I was holding my phone wrong! But the spirit from all the high school kids I talked to today comes through. So honored!! Key takeaway: Keep it real. While she’s an award-winning movie star, Glenn is not shy about showing off some of the less-glamorous parts of her job (such as washing her hair in a kitchen sink on set) or having to play fetch with her dog in a hotel hallway while traveling. She offers exclusive behind-the-scenes content to her adoring fans, and has no problem poking fun at herself. We could all learn a thing or two about taking ourselves less seriously from Ms. Close. If you jumped on the Marie Kondo train this year, chances are you’ll enjoy the content from the team behind The Home Edit. These master-organizers and Instagram sensations have been hired by top celebrities such as Gwyneth Paltrow, Reese Witherspoon, and Mandy Moore to help put their homes in order. As you can imagine, their Instagram feed offers some deeply satisfying imagery and video. Are we talking before and afters of cluttered closets? Pantries that will make your heart sing? We sure are. Compartmentalized fridges that don’t just contain a million different sticky sauce bottles? In what world? Key takeaway: Know what makes your company unique, and work with it. While an organizing business might not seem like it would be a hit on Instagram, The Home Edit team knew that the improvements they were making to peoples’ spaces were worth documenting and sharing. Read more about marketing your “boring” brand. Award-winning creative duo Dominique and Dominic think outside the box when it comes to their Instagram account. Their account, All That is She, illustrates whimsical ideas and carefully styled stunning images. They work magic in photo manipulation while still keeping the image looking real. The page is a sight to be seen not only for your enjoyment, but for creative inspiration. Key takeaway: Creativity on Instagram is limited only by your own vision. Using low-cost materials like paint, fabric, and whatever else you can think of, your brand can create truly remarkable images. Well, the name says it all. Round Boys is an account dedicated to the roundest animals on Instagram. With more than 222,000 Instagram followers, it seems the demand for animals that defy gravity is high. As the world seems to get scarier every day, it’s nice that we’re able to take a minute and just appreciate some really round fellows. Key takeaway: Stick to a theme. Once you decide on a theme, go for a consistent visual look. That means consistent colors and filters and an overall aesthetic that is easy for your followers to recognize and appreciate as they scroll Instagram. I always know a post is from Round Boys because it features a round animal. Simple as that. While Tracee Ellis Ross could probably have won most of these awards, it’s her unbeatable fashion sense that really makes us stop in our tracks (or, rather, feeds). Whether it’s to the gym or meeting Barack and Michelle Obama, Tracee can do no wrong when it comes to her look. She takes fashion risks and truly dares the camera to find a single flaw. Her followers can tell that she finds joy in her fashion choices, and she provides a glowing reminder that Instagram is built around fun. YES, I’m dressed. I might be over dressed but I’m ready. Are you outside? Key takeaway: Take risks. Tracee Ellis Ross doesn’t shy away from any fashion choice—she owns it. Have fun with your brand’s Instagram account (within reason, no career-limiting moves please) and share the joy your organization wants to represent. Once the Kardashians visit your business, it’s officially deemed the most Instagrammable Place. The museum and celebrity hotspot celebrates all things ice-cream, which means there are pools filled with sprinkles for guests to snap photos in, bright, Instagram-friendly colors everywhere you look, and tons of feature walls and interesting design elements. Key takeaway: Make your business Instagram-friendly. Whether it’s a totally immersive experience like the Museum of Ice Cream or a single feature wall for guests to take photos in front of, you want to ensure there’s something aesthetically pleasing and interesting for your customers to share on Instagram. Erica Domesek of PS I Made This encourages her followers to craft the life they want—and she shows them how. With her colorful and approachable DIY content, Erica has built a following of more than 178,000 Instagram users, and has been featured on the Martha Stewart Show, The Today Show, in Vogue, Elle, The Wall Street Journal, and more. Key takeaway: Provide your audience with educational content. While not every post has to be purely informative, it’s a great idea to engage your followers with relevant how-to content. For example, if you’re a cookie company you could share an Instagram video explaining how to get different cookie textures with different baking methods, or show ways customers can elevate their bought cookies with clever plating and presentation. With public interest in astrology experiencing a huge resurgence over the last few years, the number of horoscope-focused Instagram accounts has skyrocketed (no pun intended). With more than 406,000 Instagram followers, Not All Geminis is a joyful product of this phenomenon. The account shares astrology memes, events, and other highly-shareable content, using topical pop culture references to help her followers feel a connection to her content. THE SIGNS AS ICONIC OSCARS DRESSES! ???? Link to article in my bio + story! Who’s your fave? Who did I forget?! I love Lupita Nygong’o’s dress so much ???? Key takeaway: Keep up with current events and pop culture, and make references to these events and icons when appropriate. For example, when a big cultural event such as the Oscars took place, Not All Geminis shared Oscar-related astrology content. Figure out how you can incorporate (appropriate) pop culture references into your branded content. Jocelyn describes herself as “Grandma-inspired,” with many of her recipes being influenced by her own grandmother’s cooking. Thanks to the sharing of family stories mixed with her modern approach to these recipes, Jocelyn creates something special—and most-definitely drool-worthy—on her Instagram page. Key takeaway: Appeal to your audience’s emotions. Food is an inherently emotional topic, as some recipes can trigger personal memories. Jocelyn highlights her personal stories and memories alongside her content. According to Psychological Science, evoking emotions can increase the chance of a social message being shared. Post feel-good stories in your Instagram content, or ask your audience to share their own in the comments. In a world full of doom and gloom, The Happy News is a welcome retreat. While not suggesting we ignore the suffering and adversity experienced in our world, it’s more than okay to take a moment to reflect on the joyous content provided by this account. This will forever be one of our favourite reviews “understanding the idea behind @thehappynewspaper is one thing but experiencing what a difference it makes to see and read solely positive articles, really makes an impact” ???? you can subscribe for yourself or somebody else at: www.thehappynewspaper.com/shop (yep, we ship worldwide! ????????) the next newspaper will be posted out first week in March ???? Key takeaway: Stay positive. Chances are, your brand’s Instagram account is not the right place for negativity. Provide value to your followers with uplifting and inspirational content that makes them look forward to visiting your page. In today’s digital world, “bookstagrams”—Instagram accounts dedicated to sharing book recommendations—are worth your follow. One that stands out to us is from woman-owned Strand Book Store, New York’s largest independent bookseller. Strand shares their new releases, well-loved classics, and literary events, all with a culturally-aware twist. Comment your fav new fiction so far this year, and I’ll tell you which pouch on the right you should get ???? Key takeaway: Be authentic. Strand Book Store stays true to who they are and the types of books they recommend. Their passion for culturally-aware and independent authors translates to their posts and apparent desire to build a community with similar interests. Don’t try to be something you’re not in your Instagram posts. Your audience will immediately be able to tell. It’s also important to make sure you aren’t just marketing to your audience, but engaging and communicating with them authentically. Remember: you’re building a community, not just a sales channel. 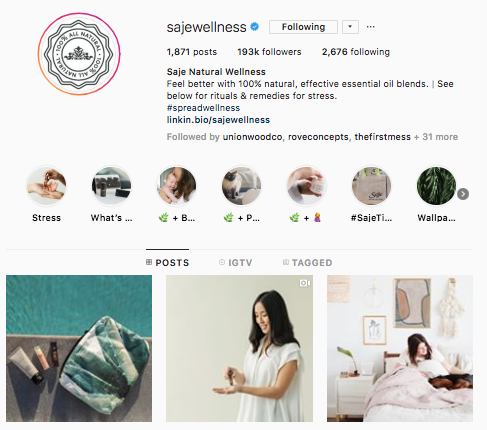 The Instagram Story is a refined art, and Saje Natural Wellness has perfected this craft. In addition to having their Stories Highlights organized on their profile with relevant headings, Saje does weekly audience Q&A sessions, shares important product launches, and even provides delightful phone wallpapers—all on their Instagram Stories. Key takeaways: Share dynamic Instagram Stories of all formats and types. Mix up your Story content with video, audience question sessions, and other valuable information and assets for your followers. If you have the time and resources, you can easily elevate your Story content by using a free tool like Canva to edit and customize content before sharing. Or you can start with our pack of 20 professionally designed templates. This little bit of extra work can make all the difference when it comes to the look and feel of your Stories. Have your own award-worthy Instagram content ready to go? With Hootsuite, you can schedule and publish photos directly to Instagram while engaging your audience, measuring your performance, and managing your other social profiles—all from a single dashboard. The post Hootsuite’s Very Prestigious Instagram “Awards” for 2019 appeared first on Hootsuite Social Media Management.